The following special offers apply to select sailings aboard this ship. To see more information click the details link for any promotion. The ships are relaxed retreats at sea for cruisers of all ages and interests. Princess cruise ships are designed with a comfortable elegance that is upscale, yet never stuffy. Princess cruise ships also offer a host of signature activities and venues, creating a reliable experience that loyal guests count on, and return to repeatedly. These “Signature” experiences include Movies under the Stars, Piazza-style atriums and the adults-only Sanctuary. In the evenings, start with a padded chaise and a soft, warm blanket. The aroma of freshly popped popcorn fills the air while a giant screen by the pool shows the latest movies and concerts. Your servers will bring the popcorn and your favorite drink right to your seat. Could there be a more relaxing way to end the day? The Piazza offers an inviting, street-safe atmosphere in the main Atrium of many Princess ships. Here you’ll find marble floors, friendly waiters, the smell of cappuccino, and fresh pastries. An open table with comfy chairs is too inviting to pass up. As you order your favorite drink, you'll enjoy the live entertainment. The International Café serves up specialty coffees, complimentary items such as fresh-baked cookies, pastries, and paninis, a selection of more than 30 wines by the glass, sushi, complimentary tapas with a beverage purchase, and even a wine shop where passengers can purchase their favorite bottles. Picture yourself on a soft chaise, eyes closed as you are enveloped in a personal calming soundtrack. The soft breeze carries the scent of the sea and ruffles the trees. Serenity Stewards await your request for a refreshing drink and healthy snack or a misting from Evian atomizer to revive your skin. You anticipate experiencing an al fresco massage in the cabana freshened with the sea breeze. Relaxation is our specialty, so treat yourself to a full day of luxurious but affordable experiences. Enjoy the relaxation and being taken care of by our highly qualified professional therapists, allowing yourself to walk away well-rested and rejuvenated. Because of the variety of amenities offered is in high demand, there is a minimal charge for the Sanctuary. The cuisine is fresh, original, and served beautifully. Enjoy familiar favorites, regional specialties, signature Princess pasta, and more. Dine with whomever you want, whenever you want with Personal Choice Dining. Savor delicious cuisine any time you'd like. Room service is complimentary, 24 hours a day. Why not escape and seek out an outstanding experience of a lifetime on your next vacation; book your Princess cruise for 2019 and 2020 today! See applicable Princess ®brochure for terms, conditions and definitions that will apply to your booking. Fares listed may require a non-refundable deposit at time of booking. Higher fares, not requiring a non-refundable deposit at time of booking, may be available. Please contact your travel consultant for more information. Guests can use the state-of-the-art computer systems located in the internet café to access their web-based email accounts or to browse the internet. Guests may also use their own wireless-enabled laptops to access the internet through the onboard wireless network. Guests may contact the Internet Café Manager onboard for information regarding the charges that apply to internet and wireless services, and any other specific requirements. Please note that internet access via satellite is significantly slower than high-speed connections on shore. Princess reserves the right to filter content accessed via the ship's internet services. High bandwidth consuming applications - such as voice over IP telephony, peer-to-peer file sharing, and streaming media - may be restricted onboard Princess vessels. The medical centers are intended to provide quality maritime medical care for guests and crew members aboard the ships; initiate appropriate stabilization, diagnostic and therapeutic maneuvers for critically ill or mentally unstable patients; support, comfort and care for patients onboard; and facilitate the timely medical evacuation of patients, if appropriate. Charges for medical services will be added to guests' shipboard account. Guests will be provided with an itemized account to submit to their insurance company. Please note that Princess ships are registered in Bermuda. Guests should verify with their insurer if coverage applies outside the United States, or purchase appropriate travel insurance. All pregnant women are required to produce a physician’s letter stating that mother and baby are in good health, fit to travel and the pregnancy is not high-risk. The letter must also include the estimated date of delivery (EDD) calculated from both Last Menstrual Period (LMP) and ultrasound (if performed). It is strongly recommend that pregnant guests review their health insurance coverage before cruising. Many policies, including Medicare, will not pay for services or hospitalization outside of the country or for emergency evacuation. Guests may want to consider Princess Vacation Protection, which is available for purchase up to the time of final payment of the cruise fare. If the guest did not secure Princess Vacation Protection, it is recommended that they secure other travel protection. Clearly marked "Designated Smoking Areas" are available onboard and include a sufficient number of ashtrays that are emptied regularly. Generally, these areas include cigar lounges, a section of the nightclub and casino, as well as a portion of the open decks. As a safety precaution, passengers are reminded to properly dispose of cigarettes, cigars and pipe tobacco, which are never to be thrown overboard as this may be sucked back into the ship and cause fires. Smoking is prohibited in all passenger staterooms and on stateroom balconies. Violations to this policy will result in a $250 fine for each occurrence, which will be charged to the guest's stateroom account. The use of electronic cigarettes is permitted in all areas onboard with the exception of dining areas and the Princess Theater. However, should a fellow guest in the vicinity feel inconvenienced and complain, even after being told the difference between electronic and real cigarettes, the guest will be asked to refrain from smoking the electronic cigarette. In addition, kosher meals and baby food are available upon advance written request. Any other special diet requests must be authorized in advance by the Princess corporate office. Guests or their travel agent must advise Princess, in writing, of any special diet, allergies, or medical needs. Requests must be received no later than 35 days prior to departure for cruises to Alaska, Canada/New England, Caribbean, Hawaii, Mexico, Panama Canal and Coastal Getaways. For all other cruises, requests must be received no later than 65 days prior to departure. Once onboard, please check with the Maitre D' to confirm the request. All Princess ships have wheelchair-accessible staterooms, but it is highly recommended that guests bring collapsible wheelchairs, as the widths of the stateroom doors vary. Guests may bring their own, or they can pre-reserve a wheelchair and have it and other medical equipment delivered to the ship by contacting Special Needs at Sea at 800-513-4515 (outside the US 954-585-0575), or by visiting Special Needs at Sea's website (http://www.specialneedsatsea.com/). Alternatively, guests may contact CareVacations at 877-478-7827 or cruiseshipassist.com. Some areas on some ships are not wheelchair accessible. Passengers utilizing mobility devices with batteries are advised that the batteries must be a dry cell type, and must be stored and recharged in the stateroom. Mobility devices of any kind, like any other items, may not be left outside the stateroom. Because of staffing limitations, it is recommended that guests travel with a companion who is physically able to assist them both onboard and onshore. Travelers with disabilities should check in with the onboard Tour Office to ensure all shore excursions can accommodate them. Not all port facilities are accessible for those using mobility devices. Ports may be accessed by a variety of methods including a ramped gangway, a series of steps or by tender. In some cases, you may be able to access the tender, but the shoreside facility will not be accessible. Many ports of call use a mechanism known as a “stair climber” to assist passengers up and down the gangway. Passengers must transfer to a Princess wheelchair, which is connected to the stair climber and operated by the ship’s personnel. Guests may be precluded from going ashore if they cannot transfer or if their personal mobility device cannot be easily disembarked. With the safety and comfort of guests in mind, the decision to permit or prohibit passengers from going ashore will be made on each occasion by the ship’s Captain, and the decision will be final. Ports that normally use tenders to access the shore are noted on the itinerary. The maximum weight of the wheelchair including guest cannot exceed 600 lbs. on transportation lifts. If the guests has purchased a Princess Transfer at the start or end of the cruise, they must be made aware that lift-equipped transportation may not be available in their port of embarkation or disembarkation. 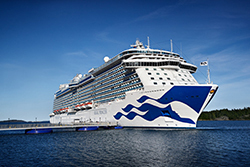 The goal of Princess Cruises is to provide a safe comfortable cruise experience for all guests. If a guest will be using a mobility device during their sailing, it is strongly recommended that they travel with a person physically fit to assist with the guest's needs both onboard and ashore. Embarking and disembarking can be challenging for those with limited mobility. Many major ports of call provide easy access for wheelchairs and scooters. However, due to various conditions - steepness of the gangway, weather, shore-side facilities, tidal and sea conditions - passengers using mobility devices may be required to transfer to a stair climber or be precluded from going ashore. Princess staff will make every effort to assist but are not allowed to individually physically lift more than 50 pounds (22 kg). The decision to allow any passenger to board a tender or disembark the vessel will be made by the Captain on the basis of the safety and welfare of all involved and is final. If passengers are unable to tender or disembark because of circumstances outlined above there will be no refund or credit for missed ports. While Princess recognizes guests' disappointment, the safety of both guests and crew takes precedence. Like your cabin close to an elevator? Prefer a specific deck? Celebrating a special occasion? Let us know here and we will customize your quote. If you've received a quote from a competitor, let us know who they are and what they quoted. 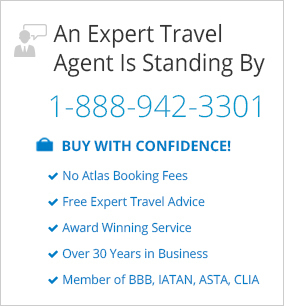 Using a travel agent is free and has many benefits. We will monitor the pricing daily and alert you of any changes we detect.